Spoilers for the first two Chronicles of Prydain, the Book of Three and the Black Cauldron, below. This is rather a change in tone from the seriousness of the Black Cauldron, being played more for humour in many places but also giving us the first real romance of the series as Taran starts to realise his feelings for Eilonwy at the prospect of losing her, and sees Prince Rhun as a rival. Rhun, a cheerfully incompetent youngster, is a likeable and interesting character who develops well during the course of the novel and his personality makes him a marked change from the previous supporting character of Ellidyr in the Black Cauldron. Taran continues his hero's journey here, and is becoming one of my favourite fantasy characters. He's wonderful - loyal, brave, and his relationships with the others are very well done, especially the rivalry with Rhun. The supporting cast is also stronger than ever - Gurgi has gone from irritating me at the start of the Book of Three, when he seemed to be something of a Gollum rip-off, to being a really wonderful companion to Taran here. I have to be completely honest and say I didn't enjoy this quite as much as the Black Cauldron, which was fabulous - the stakes never seem particularly high, strangely. Despite Eilonwy, who's a fantastic character, being kidnapped, the humorous nature of the book means the peril didn't seem to be as great as I would have expected. Having said that, the humour is really good and the added focus on the Eilonwy and Taran relationship makes it an interesting change of pace from the previous two books with their more epic plots. Alexander's writing style is always very easy to read, and it's also brilliant to have a high fantasy novel which weighs in at just a couple of hundred pages and is a fairly quick read, given the tendency of many in the genre to be significantly longer. 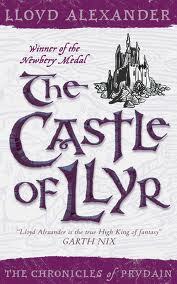 Definitely a recommendation for young fantasy fans, this is a series they shouldn't miss!